At the command center, the fire battalion chief explained there were eight city transit buses going up to Paradise and he needed the crew of four to follow him with the loader and a backhoe. 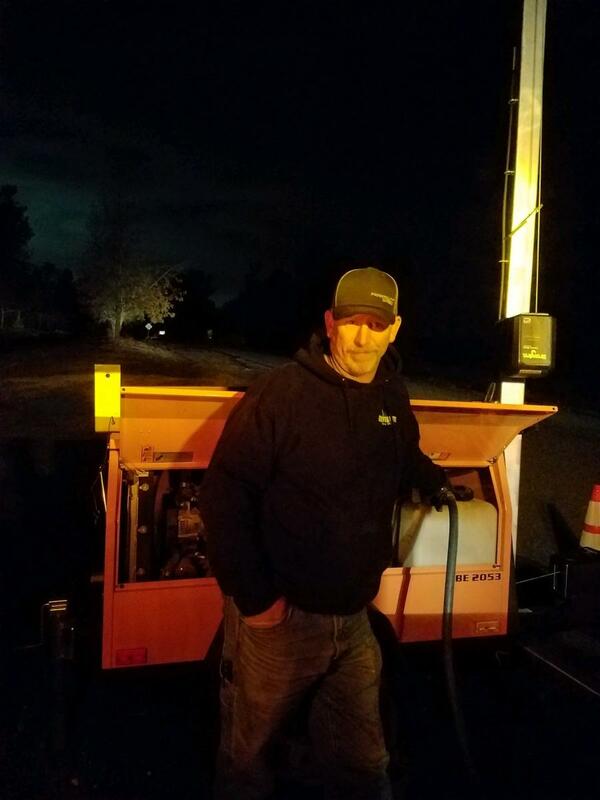 On the morning of Nov. 8, Nolan Merrifield, senior equipment operator of the Butte County, Calif., Public Works Department, headed up into the foothills above Paradise to do some roadwork. Midway there, Merrifield turned and saw a plume of smoke, then he got a call. "My boss said things are not going good," said Merrifield, a heavy equipment operator of nearly 30 years. "He said the fire was jumping over to Paradise." And so, began, the tragedy of Camp Fire which would ultimately burn 153,000 acres, take the lives of at least 85 people, destroy 13,696 homes, 275 multi-family structures and 523 businesses. Eighteen days later, when the fire was declared contained, 80 percent of the homes there were destroyed. The cause has not been identified, though downed powerlines are being considered as the possible igniting spark, with heavy winds, drought conditions and thick vegetation fueling the flames. That morning, Merrifield and co-worker, Brock Velliquette, headed down to their properties — his in lower Paradise; Velliquette's in upper Paradise. By the time Merrifield got to his 24 acres, the cloud of smoke had grown so large it almost looked like nighttime, he said. He evacuated his 11 horses, then stuck around to clear debris away from the house, dragging the land until it was as close to bare dirt as possible. I could hear explosions going," Merrifield said. "I knew everything was getting closer and closer." And that's when Merrifield went from being a heavy equipment operator, accustomed to the usual job responsibilities of paving roads and clearing snow, to a rescue worker who would risk his own life to save others. With his partner Cheryl on her way to safety, and satisfied he'd done all he could to protect his home, Merrifield returned to work. There, he joined three others to load up equipment and head to Skyway Drive to help clear trees blocking the road and the escape of evacuees. But on site, the crew of four — Merrifield, foreman Shawn Bates, leadman Jason Gangelhoff and operator Manuel Lopez — found it was not trees, but power lines. The lines remained energized and there was nothing they could do. "We left and headed down Neal Road right by my property," he recalled. "All of Neal Road is on fire. I get down by my property. I can see my house is fine, but I have fire all around my property. At that time the wind was really low, so I felt comfortable my house was OK."
"As we get into Paradise, the whole town is on fire," Merrifield said. "We go probably about a mile into town on Skyway and we stop in the middle of an intersection. We're waiting for the fire truck to move and the truck I am in is an old truck and as we're sitting there, an explosion happens close to us. I could feel the percussion inside the cab." The crew unloaded the equipment and went to work. "We push the abandoned vehicles out of the way so we can get fire trucks and buses up to the people stranded there. We go a couple miles and they load people onto buses. I go down to Clark Avenue and push trees and vehicles across the road. I am on the backhoe and it's got a four and one bucket that opens and closes. Anytime, I came to the power line or phone lines, I would put the bucket up in the air and pinch the line. If the lines were live, Merrifield believed he was safe because he was grounded by four rubber tires. "I know it could have damaged the equipment, but at that point in time it didn't matter. I go down Clark Road and there are people in cars. We get the powerlines moved so people could evacuate. There were probably 30 cars. Manny lifted the pole so they could all travel under. We go down to the K-Mart parking lot and it is full of cars and people are stranded there. So, with the eight buses, we load them up; I'm going to guess probably 20 to 30 people. Then we go around and knock on all the vehicles and make sure no one is the car." Merrifield recalls first driving along Clark Road and seeing houses that weren't burned, then coming back and see them catching fire and then on the way out, down to rubble. "Everything went so quick; it was unbelievable." The crew of four worked for roughly seven hours, moving debris and abandoned vehicles. As they worked, they were often only 30 ft. from the flames, not thinking — there was no time — just working. Merrifield and Lopez manned the equipment; Bates and Gagelhoff covered their backs. "Never in my life would I have thought I would do something like this," Merrifield said. "We cleared the way so the rescuers could go in. They really didn't have any other way. As the whole thing happened, the only way you could get in there, you had to have heavy equipment to push. We pushed a burned up school bus out of the way. People got out of their vehicles and just ran … I know a lot of people perished in their cars." Merrifield was one of the luckier ones. He lost only a few outbuildings and RVs, and his well is damaged. His co-worker, Velliquette was not so fortunate and lost his house. But the work to help others goes on. "We are two weeks out and we're still going out and doing things for the fire," he said. "The county lost a yard. We had to go remove a bunch of stuff there. It's still an ongoing thing. Unfortunately, for this area this is going to be a two to three-year process. It will never be the same."